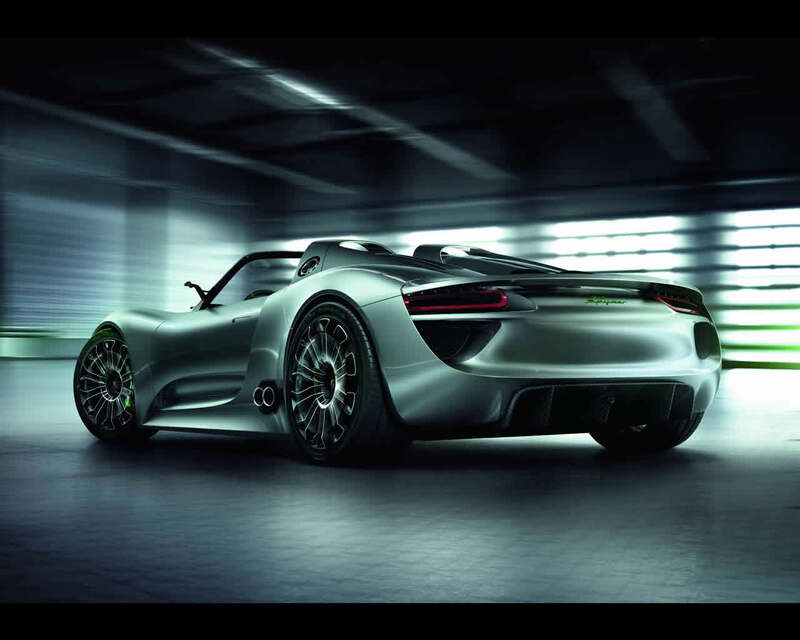 Porsche 918 Plug-In Hybrid High Performance Spyder is a near production concept car with a fuel consumption claimed for just 3 litres /100 kilometres (equivalent ro 94 mpg imp) in New European Driving Cycle, equal to a CO2 emission rating of 70 g/km.. This mid engine open two seater is powered by a high-speed V8 developing more than 500 hp as well as electric motors on the front and rear axle with overall mechanical output of 218 hp (160 kW). 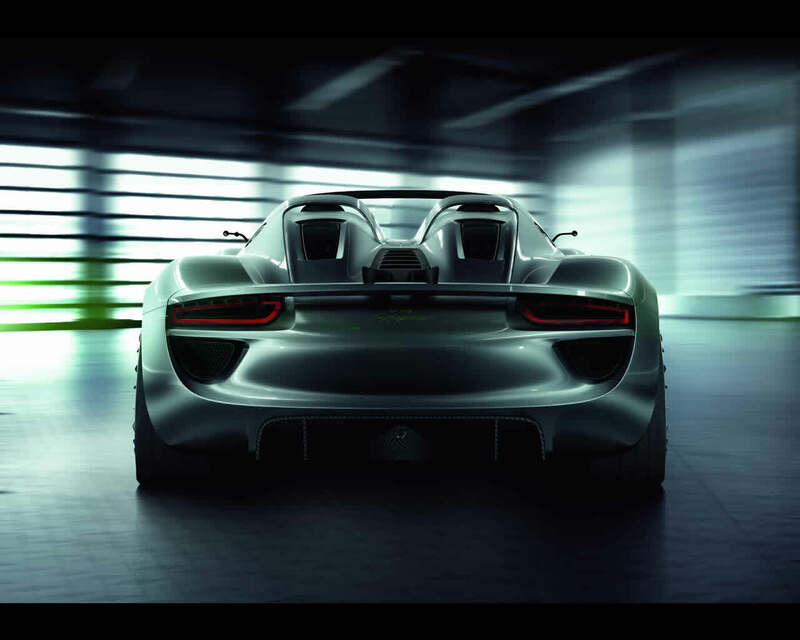 The V8 combustion engine is derived from the successful 3.4 litre power unit featured in the RS Spyder racing car. 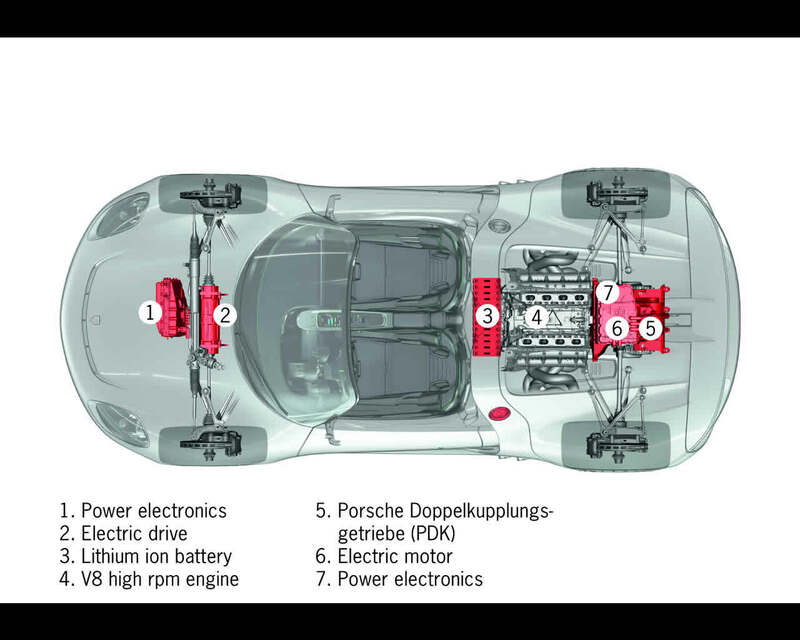 Power is transmitted to the wheels by a seven-speed Porsche-Doppelkupplungsgetriebe also feeding the power of the electric system to the rear axle. The front-wheel electric drive powers the wheels through a firm transmission ratio. The electric energy storage is a fluid-cooled lithium-ion battery positioned behind the passenger cell. The big advantage of a plug-in hybrid is that the battery can be charged on the regular electrical network. 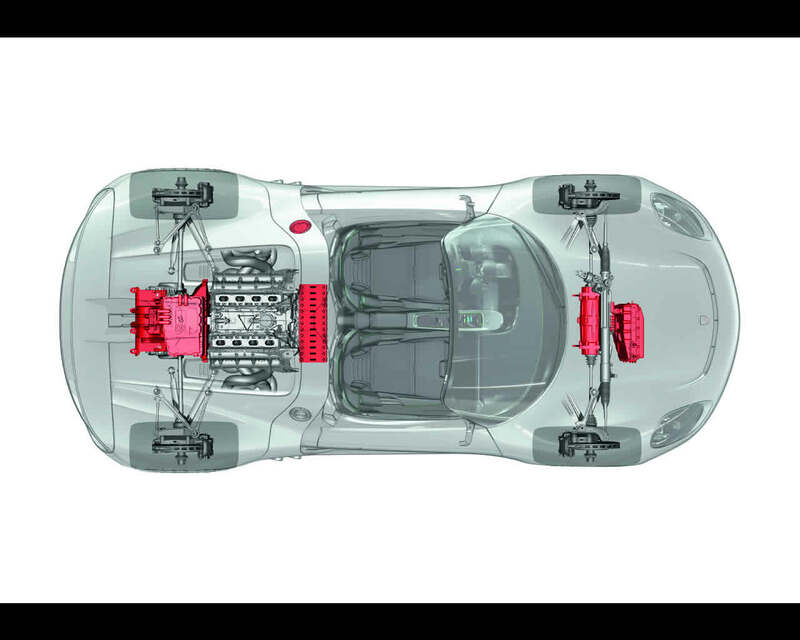 A further point is that the car’s kinetic energy is converted into electrical energy fed into the battery when applying the brakes, thus providing additional energy for fast and dynamic acceleration. A button on the steering wheel allows the driver to choose among four different running modes. The E Drive mode is for running the car under electrical power alone, with a range of up to 25 km or 16 miles. 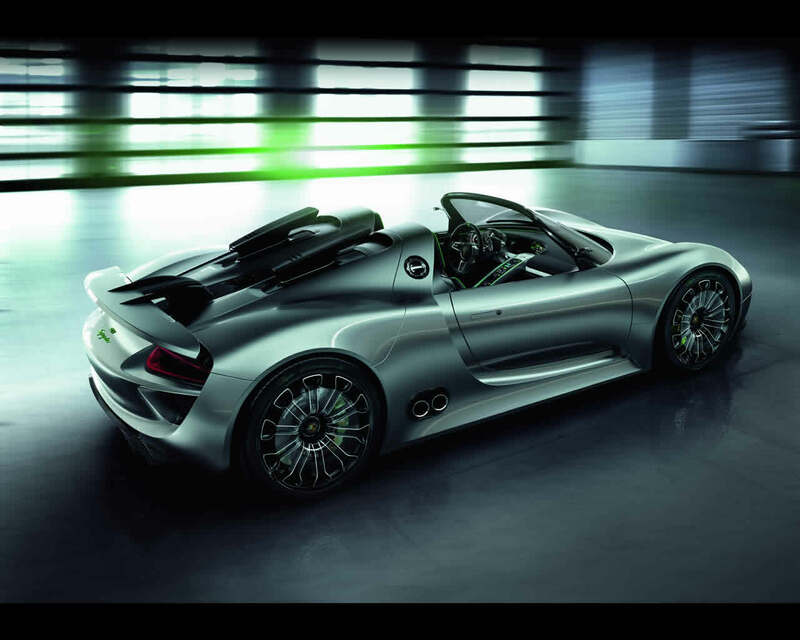 In the Hybrid mode the 918 Spyder uses both electric motors and the combustion engine as a function of driving conditions and requirements. The Sport Hybrid mode uses both drive systems but with the focus on performance. In the Race Hybrid mode the drive systems are focused on pure performance. With the battery sufficiently charged, a push-to-pass button feeds in additional electric power (E-boost) for example when overtaking or for even better performance. The modular sytucture with its monocoque body-shell made of carbon-fibre-reinforced plastic (CFP) and the appropriate use of magnesium and aluminium not only reduces weight to less than 1.490 kg or 3.285 lbs. but also ensure supreme driving precision thanks to the very high level of torsional stiffness. 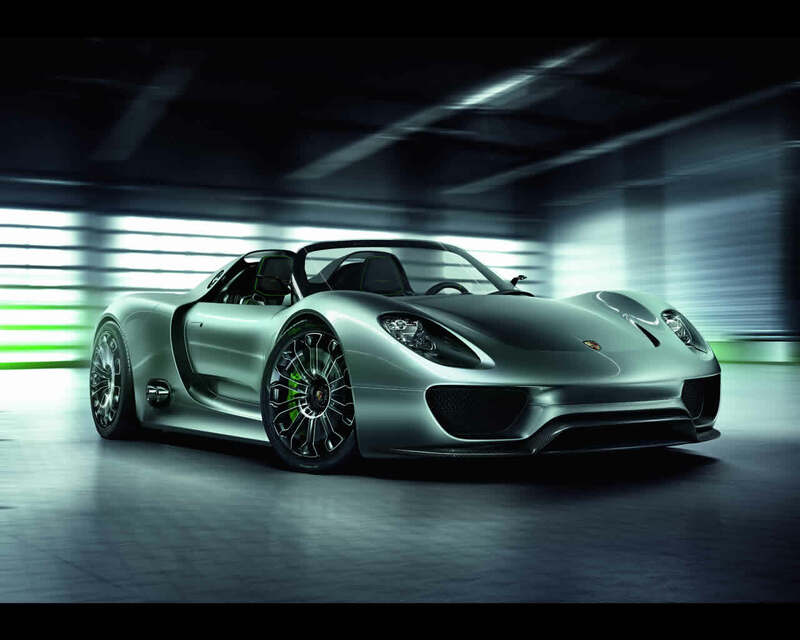 The claimed performance combine acceleration from a standstill to 100 kph in just under 3,2 seconds with a top speed of 320 kph (198 mph) and a lap time on the Nordschleife of Nurburgring in less than 7:30 minutes, faster than even the Porsche Carrera GT.